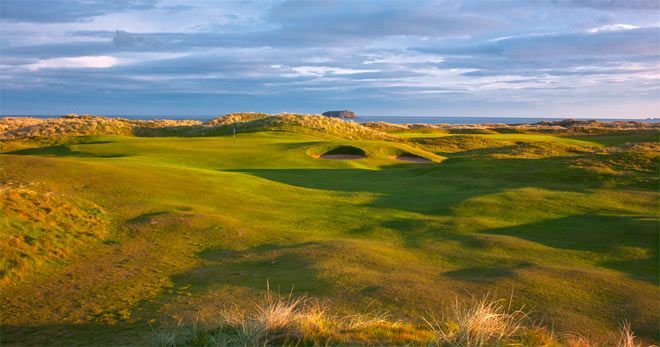 Ballyliffin is undoubtedly one of the jewels in the crown of Ireland's Links golf courses. The most, northerly course in Ireland and boasting two superb golf challenges. The magnificent new clubhouse opened in September 2000, providing first class facilities for the golfers every need. Six times Major Champion Nick Faldo visited Ballyliffin Old Links in 1993 and described it as "the most natural course I have ever played" one wonders what the conditions were like? was so taken by he subsequently tried to buy course. In 1995 Pat Ruddy and Tom Craddock were commissioned to design the Glashedy Links named after Rock offshore, thereby completing 36-hole complex. Coincidentally site covers 365-acres, exactly the same as Augusta National. But they're similarity ends, Ballyliffin is characterised by spectacular dune-land, with Atlantic Ocean North rolling hills South. 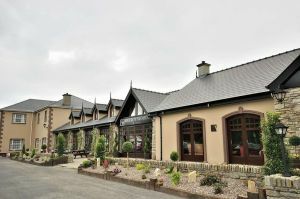 Situated on the Inishowen Peninsula and in close proximity to Derry Airport, Ballyliffin has hosted the 1998 Irish Woman's Open won by Laura Davies and was again selected, in 2002 as the venue for the North West of Ireland European Tour event. Ballyliffin's Glashedy Links was voted the No. 15-ranked golf course in Ireland, by "Golf Digest Ireland" in 2009. Ballyliffin won the Ulster Fourball Trophy in September 2006. They beat Down Royal by 5-holes in the Semi-Final in August and met Castleblayney in a close Final resulting in a 5 and halve matches to 4 and halve matches for the Donegal men. Philip McLaughlin was Ulster's top performer when they won Youths Interprovincial's at Castlerock Golf Club in May 2001. Philip took 4.5 points from a possible half-dozen. He was on the Irish Junior team that competed in the World Junior Championships in Hyogo, Japan from June 15th to the 18th 2001. Ballyliffin Golf Club won the Donegal Senior League in 2004, 2002 and 1999. They won the Minor League in 2004. The Boys' of Ballyliffin Golf Club won the Ulster Championship of The Fred Daly Plate in 2001. Thomas Kearney was Ulster Under-15 Champion in 1998. Philip McLaughlin won the Ulster Boy's Open Armature Championship in 1999. Lady Captain Ann McNicholl, Captain Pascal Harper and Des Kemmy booked their place in the final of the Mercedes Benz/Irish Independent Executive Golf Trophy at the K Club on the 17th August, 2000, when they won the regional section at Slieve Russell in July, with a score of 83pts. P. McLaughlin was selected on the Boys' Home International team at Portmarnock G. C. on 9th to 11th August 2000. US President Bill Clinton was made an Honorary Life Member of Ballyliffin Golf Club at a reception on 23rd May 2001. Tony O'Brien and Rosin Rooney produced a double for Ballyliffin by winning the Ulster Final of the Gents and Ladies Sunday Tribune-Golf Sure Personal All-Ireland singles competition. They travelled to Portugal with the club Captain John McEleney and Lady Captain Teresa O'Doherty for the National Finals. The exact date of origin of the game of Golf in the Ballyliffin area is difficult to pinpoint. Clubs in Greencastle (1893), North West (1890) and the City of Derry (1912) were already well established by the 1940's and supposedly their success acted as a reassuring prompt to the formal establishment of a Club in Ballyliffin. The game had been played spasmodically at Pollen Green (Gerard Grants Land) by members of the British Army, stationed at Leenan Fort and later in the 1920's and 1930's by Carndonagh Bankers and others who could afford the time. In any case by the middle to late 1940's after the end of World War ll the concept of establishing a Club in the area gained momentum. A meeting of those interested in the formation of the Golf Club at Ballyliffin was held in Ballyliffin Hall on 2nd April, 1947. It was formally proposed by Dr. F. C. Friel, seconded by P.J. McCarroll and passed unanimously that the Ballyliffin Golf Club be established. By the 8th August 1947, a lease of all the necessary rights for a period of ten years was granted by the ten landowners concerned to the newly elected trustees of the Club, namely Rev. J. Gallagher, M.D. White, Patrick J. O'Doherty, Patrick Gallen and Bernard Harkin, for an initial annual sum of £1 per year per landowner. The course was unofficially declared open for play to Members in June, but because the newly laid greens were still quite rough it was decided to postpone the official opening until their condition improved. At the A.G.M. of this historic year, the Honorary Secretary Mr Patrick J. O'Doherty recorded the following prophetic assessment.."In the opinion of the Committee, the prospects for the Club in the coming years are bright. The initial work is now over and a course is in existence and although perhaps not up to the standard of other 9-hole courses, it is capable of great development, and has the advantages of being ideally situated and free from major obstructions...". May 2nd, 1948 was the date eventually chosen to mark the official opening of the Club. 1948 - 1949 saw the Club continuing to expand not least reflected in the £10 purchase of its first mower - The Atco Motor Mower, which at the time was seen as a monumental achievement but in reality it proved to be a mechanical nightmare. On 26th June, 1949 the Club participated in its first competitive match - away to Greencastle, in which they were defeated 6 and 1. However, on the return match at home, Ballyliffin recorded a first team victory 4 and 2 with 2 half matches. Membership of the Club didn't just mean turning up to play a round of golf, in practice it meant that members were the Club, body and soul, physically and emotionally. before their round of Golf they brought along their own lawnmowers to cut greens and tees and to check on wire that enclosed the greens (used to protect them from the animals that grazed the fairways - the original 'gang mower' if you like!). Quite simply they prepared the course first and then got down to the business of golf. Thus the beginning of the unique 'spirit of Ballyliffin' - good humoured selfless participation. At the A.G.M. of 16th April, 1952 Patrick J O'Doherty The Honorary Secretary recorded the following observations..."The position of the Club after 5 years of existence is that it has succeeded in establishing a useful 9-hole course at Ballyliffin. A great deal of work of laying out and maintaining the links was carried out voluntarily by the members' themselves and one of the features of the club during these five years has been the spirit of friendly co-operation between all members in this respect. The links have provided a welcome source of recreation for a large number of people and the series of competitions and out matches provided opportunities for friendly social contact with members of neighboring clubs.....The Ballyliffin Golf Club has made something of a name for itself in Inishowen." Development of the Club proved to be slow and painstaking. Throughout the 1950's, 60's and 70's for a small Club with limited resources progress was hard won. It took tremendous commitment and dedication and naturally there were times when frustration posed the question of whether the venture was worth the effort at all. At the A.G.M. of 11th May, 1957 members decided to use the Strand Hotel as the official clubhouse until such times as a New Clubhouse would be erected on site, pending arriving at a conclusive agreement with the landowners. On the 26th October, 1956, the medium term future of the Club was secured when the landowners agreed to extend the lease of land up to 1972. The early 1960's saw the commencement of the long association between the Club and the Irish Christian Brotherhood. For years, the Brothers were an integral part of the Club and its activities and indeed they also gave of their free time coaching children from the local community in the skills and etiquette of golf. This era also saw the gradual development of the Club in terms of increased membership, improved revenue and an increase in green fee contributions. In 1964-65, for perhaps the first time in the club's history, the Honorary Treasurer recorded a profit of £500 for the season which naturally at the time was considered phenomenal business. As the 1960's drew to a close the question of the renewal if the land lease had to addressed. At this stage, confidence within the Club was growing and the concept of actually purchasing the land on which the course was situated began to germinate or at the very lease the securing of another long term lease was considered essential for the future of the Club. As fate would have it events took a twist, the reverberations of which echo loudly in our glad ears 50 years on. In 1968 it was obvious that there was not going to be a renewal of the lease over the 9 Hole Course so the then committee felt they had to look at some other option. On the proposal of Martin Hopkins, who was an agricultural advisor in the area and had a vast knowledge of the terrain involved, it was decided that the committee would look at leasing a very large area of links territory outside the then 9 Hole Course. There was much negotiation over 1967/78 and in this respect great credit is due to Eddie Grant, who as a spokesperson for the landowners concerned was mainly responsible for getting the agreement to sell the portions of land in this commonage - for this was a commonage, a very big commonage of 400 or more acres. James McLaughlin and the secretary Clement Sweeney represented the Club in the negotiations, and due to their local knowledge interviewed all the landowners in turn and got their approval to sell their portions to the Golf Club at £500 per share. Work on the 'new' course began in 1970, that is what we now know as the 'old' links. At first 9 holes were prepared for play and eventually by 1973 eighteen holes were in play. Eddie Hackett who was the golfing architect attached to Bord Failte, visited the course on several occasions and helped to lay out the playing holes, although it is true to say that two English architects visited the course as well and gave their views on how it should be laid out. They were Lawrie and Pennick. 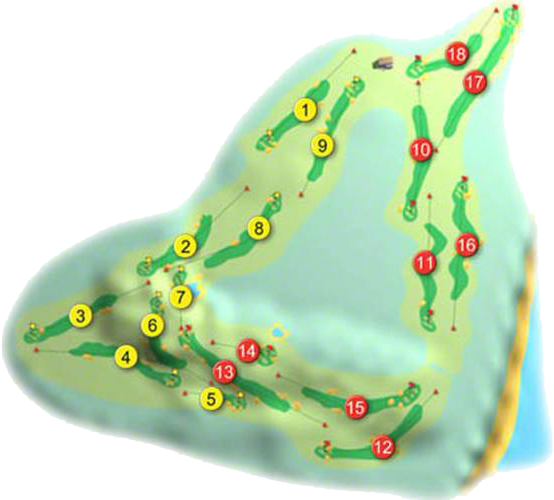 In the final analysis, the course which emerged, perhaps took something from each of them, and quite a few suggestions from Martin Hopkins were incorporated in the final pattern. The acquisition of almost 400 acres of land, in practical terms accentuated financial concerns to a new level. It's one thing purchasing, it's quite another paying! While protracted land negotiations continued Council faced up to the task of increasing revenue. Annual subscriptions, green fees and in fact, every imaginable source was explored. The most successful initiative proved to be the selling of shares to members for a percentage return in their investments. Generally speaking though, the Club was to be fortunate in the "the spell of Ballyliffin" was spreading, reflected in an increase in memberships and green fee intake. In fact 1968 -1969 was reported as the most successful year for the Club to date - culminating on the Club holding its first Open Week (when over 1400 people played) and the Club being voted Club of the Year in 1969 by the 'Evening Herald' newspaper (incidentally, Open Week, the brainchild of Mr. Joe Masterson, was the first such event held in Ireland!). In accordance with the expansion of the Club in general, competitive life expanded also. By 1970 there were over 34 competitions to be competed for. At the A.G.M. of 26th February, 1973 the secretary reported that the Club had vacated the 'old' course to play the "Old Links". Mr. Hopkins reported that Mr. Eddie Hackett (the revered Golf Course architect) had visited the course twice and had assisted in the siting of tees and green and had been extremely forthcoming in giving advice on the new project in general. In general, the 1970's was an era of constant serious financial crises which inhibited growth and development of the Club. On 16th September, 1977 an E.G.M. was held to address the economic depression that had enveloped the Club. The Treasurer reported an overdraft of £10,010 plus interest due on shares of £1,011. Special committee were formed to: 1. Run Monthly Concerts 2. Organise a Club Draw and 3. Run Bazaars. Members of the Ladies Committee would be co-opted onto these committees. It was make or bust for the Club! Six months later, at the A.G.M. of 17th February, 1978 the Treasurer, reported that the Bazaar and Raffle Committees, by raising £1,160 had effectively rescued the Club from a precarious financial position. There appeared to be no long-term solution to the Club's dire financial straits especially when, (apart from some County Council funding acquired throughout the offices of Councilor Conal Doogan) no grants were forthcoming to alleviate the financial burdens of a young Club engaged in major development. In the end, the answer, as always, came from within. The "Spirit of Ballyliffin" persevered in the form of dedicated members who stood up and were counted. they would not, and did not, allow a defeatist attitude to prevail - to destroy the enterprise and dedication of our founder and subsequent members. Their dogged persistence, driven by love of and loyalty to the Club eventually ensured that the ship was steered through troubled waters and by 1980 her position had stabilised and returned to an even keel. Remarkably in spite of the trials and tribulations of the previous 10 years the Club was planning another chapter. At the 1979-1980 A.G.M. Mr. L. O'Doherty (Auditor) warned the members against the folly of retarding development for the sake of monetary considerations. Mr. Doherty was giving voice to a burning desire within the Club to improve and expand. At the A.G.M. of 24th February, 1980 members agreed that the time had come to make the Club more attractive for members and visitors alike, and accordingly the implementation of a development plan was agreed...the Club would build a new Clubhouse! The existing Clubhouse was in urgent need of repair, with, not least, the Insurance Company expressing grave concerns about the decrepit state of the building. Again money would have to be raised, and quickly. The balance figure for 1984 revealed that the year was a disastrous one for the Club - financially speaking. However, in subsequent years, with a marked increase in the popularity of golf in general, the Club performed with a much greater degree of profitability. With increased profitability confidence was restored and thus in 1986 a firm commitment was made to undertake a major fund-raising programme to raise capital for the provision of a new clubhouse. At the A.G.M. of 1st February, 1987 the Auditor declared that the £100 Draw had been a magnificent success and thus the Club had a credit balance of £102,826.74. The official opening of the New Clubhouse in 1987 perhaps symbolically represents the point when the sleeping giant that was Ballyliffin Golf Club, exploded onto the golfing map of the world to take its place amongst some of the greatest courses in the world. From this historic moment the Club would never look back Ballyliffin Golf Club suddenly became a business that necessitated careful management. From 1987 membership numbers mushroomed, green fees almost tripled and the numbers of societies playing increases to the point where they had to be regulated. It is a success story that would undoubtedly have been beyond imagination a mere 3 years previous to the opening of the New Building. The Auditors report that £71,000 had been spent on the construction of the building, a further £9,000 on furnishings with plans for future investment on a machinery store. A Development Committee was established by Council towards the end of 1991 following a proposal by the Captain for that year, Cormac McDonough. The purpose in setting up this committee was to try to draw up a long term plan for the clubs future which would address the problem of constant pressure on the course and clubhouse from visiting players. In early summer of 1992 members of the committee met with Pat Ruddy and Tom Craddock, golf course architects from Dublin. The object of this meeting, which took place at Ballyliffin Golf Club was to discuss the possibility of adding a remainder of the land owned by the club. Messrs. Ruddy & Craddock stated that the land was probably the finest piece of links golfing terrain that they had ever seen and the possibilities for developing it as a golf links were mind-boggling. They strongly advised the club to build a second course of championship standard. Following a further meeting with Ruddy & Craddock in Monaghan at the end of the summer the committee recommended to Council that Ruddy & Craddock be employed to design the new course. The instructions given to the course designers was to create a world class championship course. In mid-May 1993, the diggers and farrex trucks rolled in and worked like clockwork for the next three months shaping fairways, greens and tees. Seeding of the course began in September and from then on it was fingers crossed that the weather would be favorable. But there was no need to worry - that autumn and winter could not have been more benign. While all this work was going on the committee embarked on the job of getting Inter Reg Funding from Bord Failte. A deputation travelled to Dublin to make a presentation to Mr. Charles McCreevy, Minister for Tourism and Trade. Eventually the effort was rewarded when a grant of £315,000 was approved. Construction of the course began on 7th May 1993 and was completed in record time with the opening taking place on 3rd August, 1995. Even Ruddy & Craddock were surprised at the speed of construction. The outstanding work of the committee has ushered in a new and exciting era for the club. Visiting golf journalists and professionals agree that the Glashedy Links is a course of stunning design and proportions. The Opening Day, on the 3rd August, 1995 was organised by the Committee and it proved to be a great success. Soon afterwards the first ball on the new course was struck as Jimmy Cuddihy, Captain, drove off in a competition for members and guests to mark the occasion.